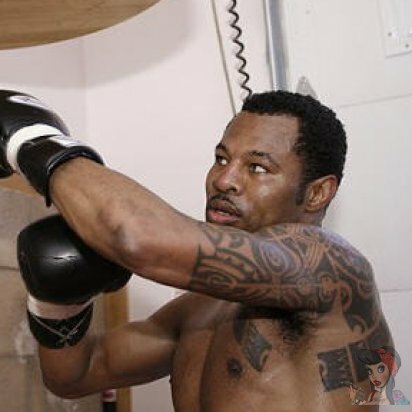 Shane Andre Mosley is a retired American professional boxer from Pomona, California. Mosley has held world titles in three weight divisions, having held the IBF lightweight title, Lineal, WBC, & WBA (Super) welterweight titles, and Lineal, WBC, WBA (Super), & The Ring light-middleweight titles. In 2000 and 2001 he was The Ring pound for pound best fighter in the world. 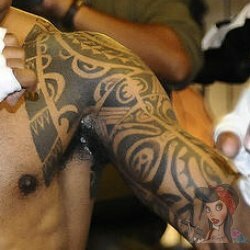 Shane got a large Maori tattoo on his upper right arm. This type of tattoo usually signifies a warrior since that is the origin of that type of tattoo. It wraps around his upper arm and goes into his chest and back. Done with no color this is a clean tough tattoo.